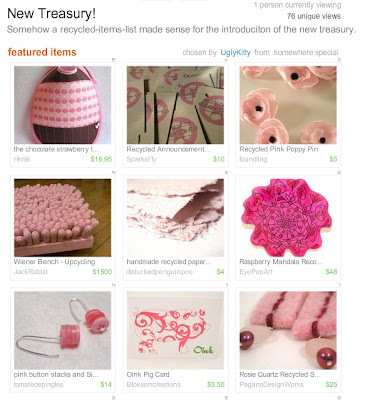 Groovy green treasury with my Lime Green cuff in it! Click here! 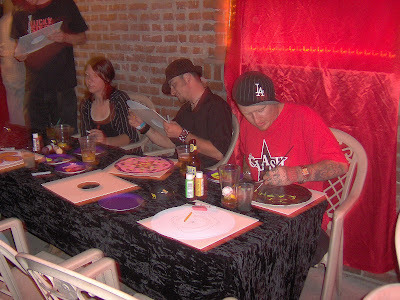 I had a great time at the Ash Street on Thursday night, where I led a mandala-making workshop for the invited guests at the private Floater show. 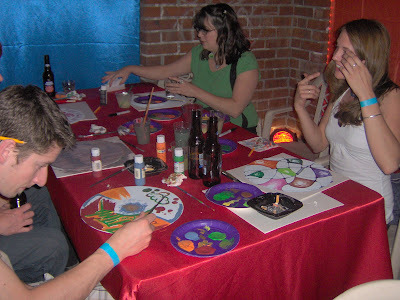 It was such a trip to look around and see so many adult hipsters, sitting in a bar, and creating fabulous art. I met a lot of cool people and had a blast. There were some pro photographers there who took a million pictures and promised to send me some - for now, this is the best I could get with my camera. Special thanks to Chuck and Suzie for being my assistants, you guys rock! I've finally gotten some good photos of my latest batch of cuffs and am ready to do some new listings in my Etsy shop. For starters, here's "The Silvery Eye." I am in love with the background color on this cuff! I actually custom-mixed it for a cuff I made for Chuck (my husband). It is iridescent silver mixed with Payne's Gray. Fabulous! This is the only other cuff I used the color on. It is really shimmery. 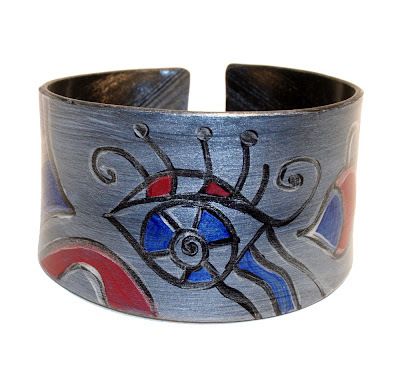 I also like the psychedelic eye motif. It's so totally Eye Pop! 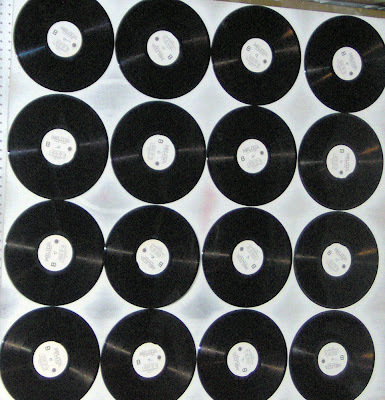 I just finished spray-priming the last batch of records (I can do 16 at a time) to make the 100 I need for tomorrow night's gig. I've been hired by a marketing firm to do an art project with 100 invited guests at a private party, which is taking place at my favorite local club, the Ash Street Saloon. Floater will be playing along with Castella. All this and mandalas, too. 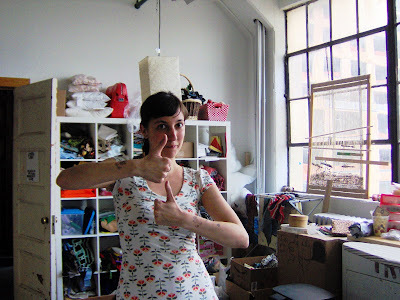 What trip to New York would be complete without a visit to the Etsy Labs? In honor of Etsy's birthday, I thought I'd share my photos from my visit there last month. This is Anda. She was really nice, gave us a tour and made me some coffee. This is Luca from Lushbox Inc. She was using the labs to print labels for her cosmetics. Her husband is also one of the Etsy admins. 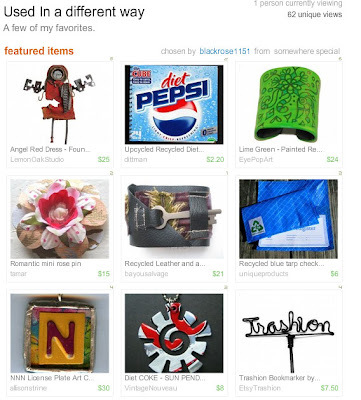 I found my work in three different treasuries on Etsy today! I'm honored to be on the same page as the famous Wiener Bench. This is me, Kat, and Suzie. 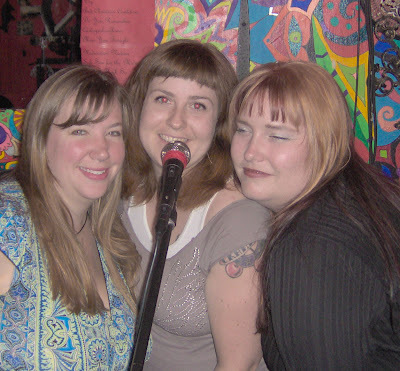 We are the back-up singers for Dartgun. We have just started a myspace page and we need friends! Please visit us at www.myspace.com/andthevignettes. Thanks! It's a simple fact - of the 8 million people in the city of New York, there's not one person who I could have had a better time staying with than my own dear friend Joan. And she also just happens to have the coolest car in Brooklyn! Joan actually found this vintage yellow Checker cab at a thrift store in her home town of New Orleans. I believe she had it in storage for a long time before she was able to get it running. Here she is with her excellent car, parked outside of her apartment in Bed-Stuy. Here's an old Polaroid from when I first met Joan, back in 1993. We are hanging out on the balcony of the garage apartment ("The Exedra") where I briefly lived with our friend Phoebe in the Dallas, Texas area. I was 18 and Joan was 15. 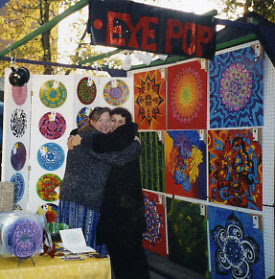 Here's me and Joan at my Saturday Market booth when she came to visit me in Portland in 2004. And here we are at Coney Island last month! 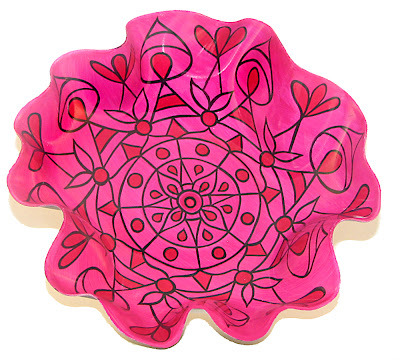 A pleasant surprise - my Raspberry Record Bowl got reviewed this week in the Funky & Fabulous column of the shopping blog Wickedly Chic. Under the heading "Indie Kitchen Style," my bowl is noted as the answer to the question: "So what else can I add to my kitchen decor to really funk it up?" Please click here to read the whole story about this "sure-fire conversation piece." Sweetpea Handcrafts and Bella Style Boutique were also featured in the article - check them out and have fun decorating your kitchen! 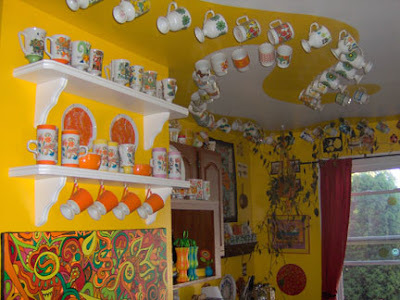 Come over for coffee or tea! 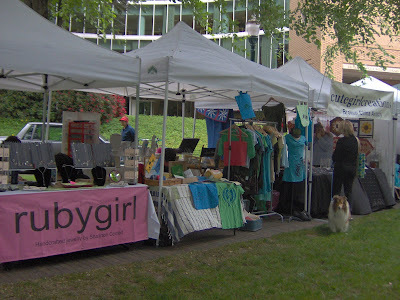 Yesterday was the PDX Etsy Art & Craft summer sale. This picture was taken early in the morning, before the rains came. 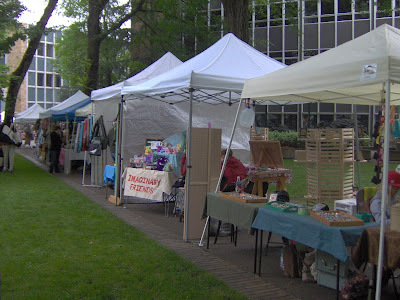 I am hoping we will be able to repeat this event again this summer and hopefully get some better weather! 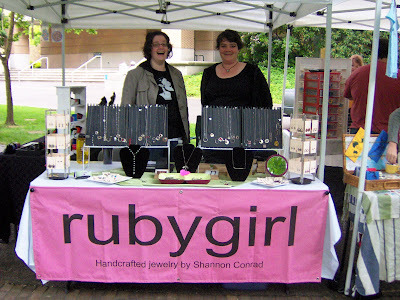 I had fun despite the soaking conditions, and I enjoyed meeting so many cool Portland Etsyians, including Rubygirl, who shared my canopy. Many thanks to Urbana and mmmfiber for organizing the event! I just received the new issue of a zine called A Handmade Life. It is made by Robin from Alchemy Studios. I picked up this sweet little number at EyePopArt.etsy.com and I gotta tell ya, I love it. At 7 x 7 inches, it's just right for sticking in a purse or overnight bag, and the hand-drawn mandalas are, in fact, completely meditative to work on. I tend to work in coloring books on a here-and-there basis, but I can't put this thing down. I'm hooked. I'm strung out on Mandalas, man. Please check out the Alchemy Studios shop to get your copy of this great zine, as well as cool mixed media collages, ACEOs, and Marvy Monsters (love 'em!). 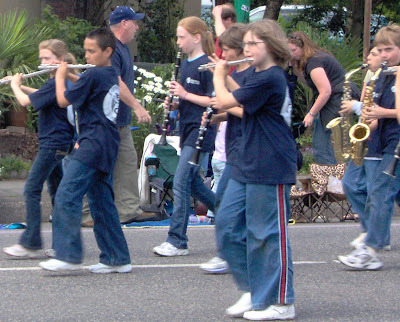 That's my son (with the red stripe on his jeans), playing his flute with the rest of his fifth grade band during yesterday's Portland Rose Festival Junior Parade. Today Julius is spending the afternoon at Da Vinci Arts Middle School, which he'll be attending next year, and tomorrow he is marching in yet another parade - the annual Duniway School parade in Portland's Eastmoreland neighborhood. There's only one more week of school! 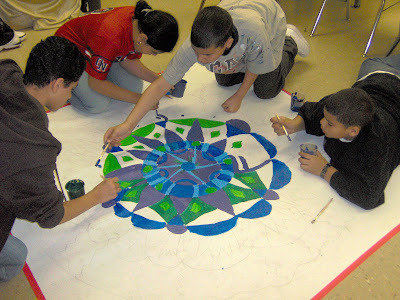 To continue my story of the mandala project at Henry Street Middle School in Manhattan...on Tuesday, May 1, I worked with the second of three groups of seventh graders to design and paint a big mandala to be permanently hung in the school. This group used cool colors in their painting. 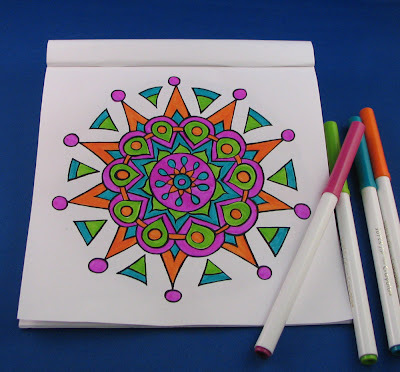 At the end of the class period, I drew a name out of a hat and gave away one of my Mod Mandalas Coloring Books. This girl was so happy to be the winner! She even asked me to autograph it. 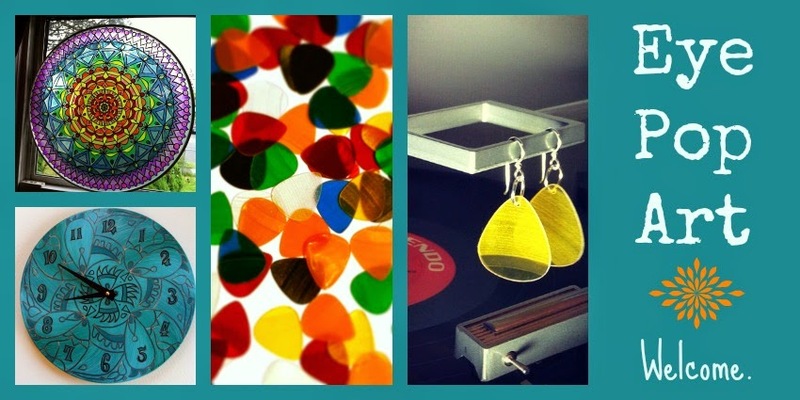 Look, look, cool earrings made with pieces of vinyl records! 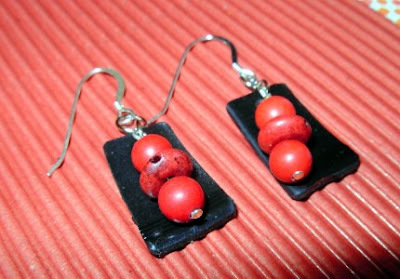 These red and black ones rock. You can find them at Groovy Vinyl on Etsy. 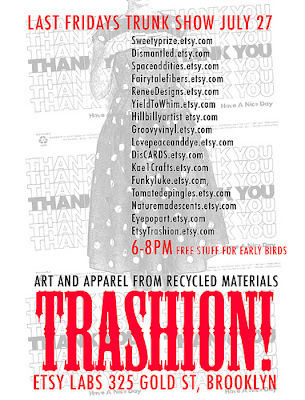 Terri from Groovy Vinyl is also a member of the Trashion street team. 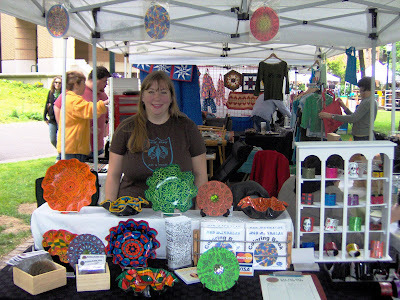 She has been featuring different Trashion artists on her blog, and she recently featured me! Click here to read all about it. 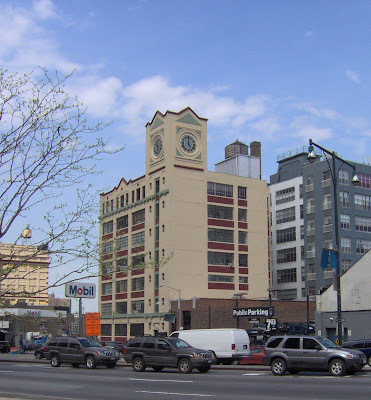 This week marked my last-ever meeting of the Duniway Art Committee. It's been a good run. 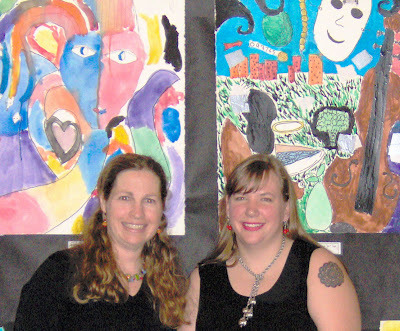 I've been volunteering for Dunway's parent-led art program for the last eight years, a committee member for five years, and committee chair for three years along with my awesome co-chair, Michelle (pictured here with me at the 2005 Duniway Student Art Show). 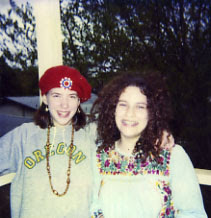 Now that my youngest child is moving on to middle school, it's time for me to move on too. 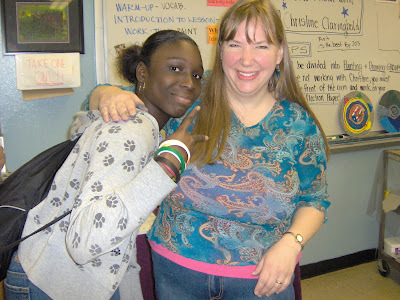 I'm so glad to have had this great experience, which has helped me to get all my other teaching gigs. Thanks, Michelle, Brenda, Kathy, Mandy, Lisa, Kimberlee, Elizabeth, Alison, Susan, Corrina, Rachel, Beth, Gigi, Dawn, Danielle, and all the other wonderful people I have had the pleasure to work with over the years at Duniway. I'll miss you!